You’ve been eyeing the beautiful pictures on Instagram or online for a long time and you’re finally going to visit that National park this summer. And, of course, because you hardly do anything without your furry sidekick, you’re dog is coming with you. Then you find out that dogs aren’t allowed in National Parks and your dreams are dashed. First, the statement that “dogs aren’t allowed” is misleading. They ARE allowed inside of the park with you. However, it is true that most of the National Park will be off-limits to them, and by default, you. That doesn’t’ mean you have to cancel your trip though. Knowing these 3 things will not only make your trip possible but, with some more planning, it can be an even better adventure than you initially had planned. The rules for dogs inside of National Parks are pretty restrictive. In general, dogs are only allowed along roadways, in parking lots, and in campgrounds. Unfortunately, that means you won’t be able to hike any of the famous trails while you are visiting. However, some dirt roads have a wide shoulder, or don’t see much traffic, and make for a descent hike. If seeing the park from the comfort of your car is more your style, you probably won’t feel as restricted. Your dog can ride in the car along scenic byways and can even get out at some of the pull-outs. 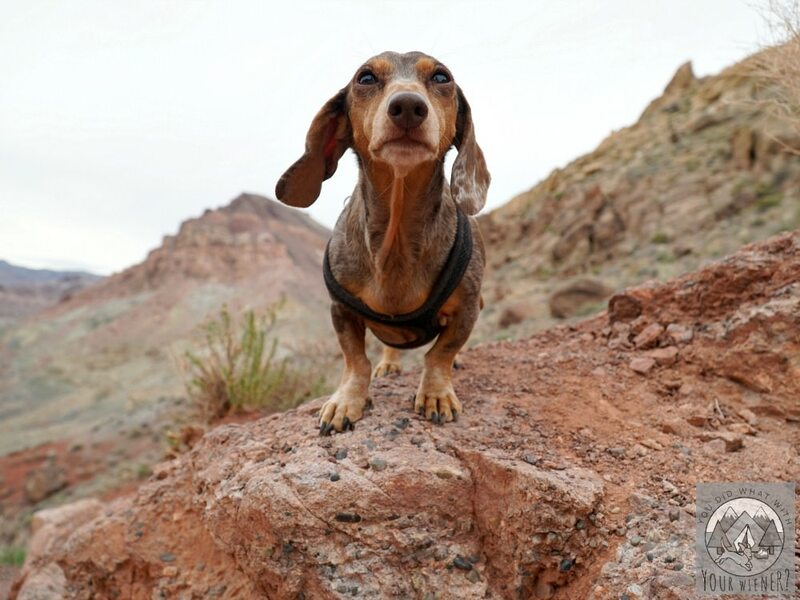 Just know that some of the attractions require walking a short trail to get there – like Zabriske Point in Death Valley National Park – so you won’t be able to do that with your dog. If you are traveling in an RV with air conditioning, and your dog is well-behaved (no excessive barking when you leave), you might be able to leave them in there for short periods. You’re probably saying, “WHAT?? 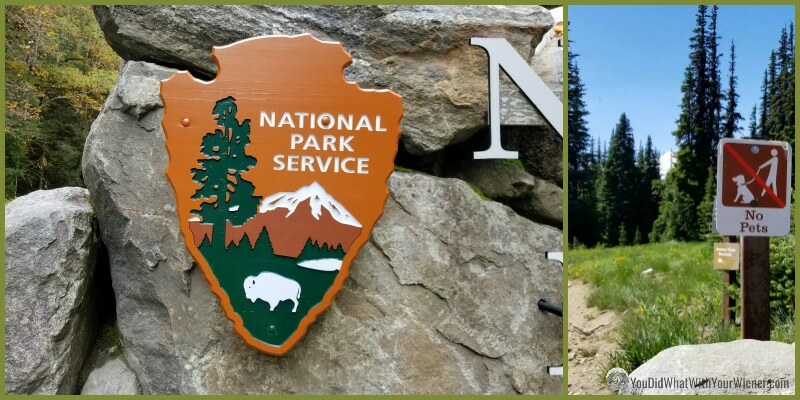 What does that have to do with bringing my dog to a National Park?”. It has a lot to do with it, actually. The park rules state that dogs are allowed within 50 feet of roads. That means 50 feet on either side. If you know your average stride length you can pace out the distance your dog is allowed to go. Along some roadways, there are some cool photo ops within the 50 feet limit. You can find your average pace length my going to a quarter mile track. You can count, or use a pedometer, to track the number of steps it takes you to walk around it once. Then divide the distance (there are 1,320 feet in a quarter mile) by the number of steps. Depending on height, gender, and walking pattern, the average stride length is between 2 and 2.5 feet. For an example, I am 5′ 6″ and my average stride length is 2 feet. I know I can walk approximately 25 natural steps from the roadway edge to take pictures of the scenery with my dog and not be breaking the National Park pet rules. National Parks aren’t necessarily all they’re cracked up to be. Especially if you’re a person who doesn’t go if your dog can’t. National Parks are incredibly beautiful, don’t get me wrong. However, they aren’t the ONLY amazing places in the United States and there are some down-sides to visiting. The main down side is the crowds. The Yosemite Valley is so crowded in the summers, the valley has been known to fill with smog from vehicle exhaust! I visited Yellowstone in the summer a few years ago and we couldn’t even see some of the sights because the parking lots were full. If you like feeling like you’re at a concert or in a crowded mall while enjoying nature, popular National Parks are just up your alley. I’m willing to be that’s not the case though. Also, keep in mind that crowded places, especially when there are other dogs, can be stressful for some pets… which can further put you on edge. There are plenty of beautiful and amazing natural places to see where dogs are allowed and they aren’t as crowded. Look for trails and sights near the National Park you want to visit. Great places to look are adjacent National Forest lands or at nearby State Parks and National Monuments. Marmot Pass near Olympic National Park. I’m not saying don’t visit National Parks with your dog. You should. I’m saying, with some research, you can find plenty of things to do in the area with your dog so don’t NOT visit a National Park just because the access for dogs is limited. Which National Park is your favorite or at the top of your bucket list? Your photos are amazing! It’s nice to know that dog owners don’t have to totally cancel a National Park trip, and that there are still things for them to enjoy with their dog. The info about calculating your average stride is very interesting! Great article, love the pics and I agree with you. If the purpose is to get out and about and do some hiking with your dog, why choose a place with so many restrictions? While national parks are stunning, the rules and the crowds can make them less then desirable. With a little research you can find plenty of gorgeous dog friendly places to visit, while having the added benefit of some peace and quiet. I hear so many people say they don’t go see a National Park because their dog can’t hike there. Like they are discounting the whole area because of that. I say go anyway, drive through and see what you can, then spend time hiking and exploring with your dog just outside of the park boundary. Oohh my wife and I love hiking, and we also love our dogs. If / when we go to a national park next, we’ll have to keep these things in mind! I love that you have figured out your stride length and how far that means you can veer of the course and still be legal. I never would have thought of that! We have visited lots of state parks with Ruby and the rules really vary. Our favorites are Custer State Park in SD and Niagara Falls. We also visited the Cape Cod National Seashore (kind of like a national park) with Ruby this past summer. She was allowed on the paths and some of the beaches, which was really fun. However, we were there slightly off season so not sure if the rules are different during high season. I’m kind of nerdy like that. Ha, ha. State Parks are great because most are way more flexible in regard to pets. Besides being on leash, and picking up after your dog, there are almost no restrictions here in Washington. Maybe once Bravo gets older and more settled (and less car sick!) we can travel more with him. He’d love sniffing out all the great spots at various parks. Boo.. hopes he grows out of being carsick. I was so worried that Summit would have an issue riding in the car when we got her. Road trips are one of my favorite things to do with my dogs and Gretel loves it. I am happy to hear that you can take to some, I wanted to go to Muir Woods with Layla and they would not allow her in not even in her backpack so I cancelled the trip 🙁 For me if she cannot come I will not go and I will not leave her in a car. Yeah, unfortunately, I’ve heard that there are a lot of areas off limits to dogs in California, not just the National Parks. Great post! I generally try to find hiking areas just outside of nation parks, where my dogs are allowed with me. Hiking just isn’t quite the same without them, and I always feel super guilty if I have to leave them behind. Me too. I’ve found many amazing and, almost more importantly, uncrowded trails, just outside of National Parks. They may not be the same views but some are similar and just as pretty. It’s my first time visiting your blog and the second I arrived, I was in love. First off, your blog name made me laugh out loud. Second, your dog and photos are fantastic. And third, this post is so honest and helpful – so many people just avoid the parks because the guidelines can be confusing. Thank you for all the kind words! I see so many generic posts about visiting National Parks with dogs so I wanted to offer something a little different. Sadly my knees and Kilo the Pug’s fear mean we do very short hikes on leash in local ravines. However great to know these National Park rules as planning some road trips with him next year and may explore more. Road trips are great for creaky knees! My knees continue to get worse so I know, someday, my hiking will be largely over. It makes me sad but there are so many cool things you can see from the car or that only involve walking around a parking lot or very short path. Excellent advice Jessica, thanks. Wow, Stride Length – I confess I’ve never considered that. 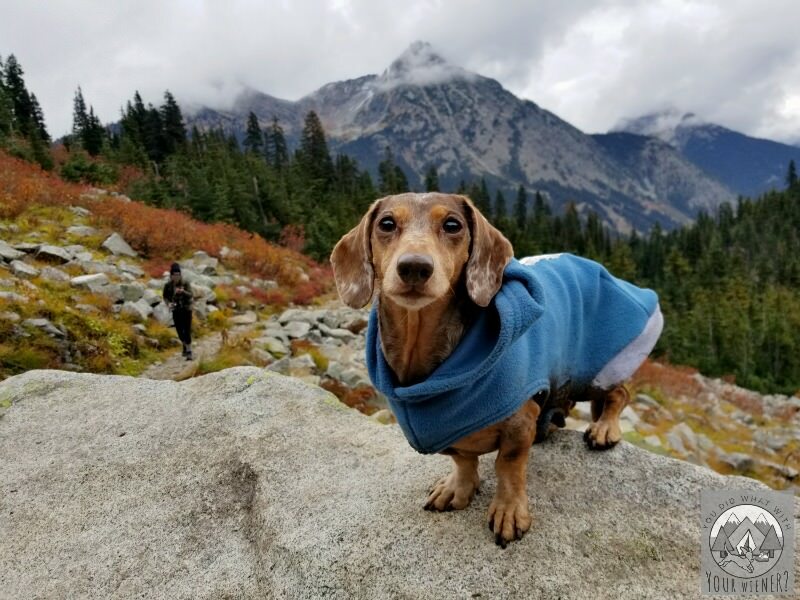 National Forests are so much more dog friendly than National Parks, they’re often a better bet. Sedona, Arizona is extremely dog friendly with miles of hiking. Every hike has stunning scenery and vistas! I was hoping to get to Acadia National Park in Maine this year but it didn’t happen. Maybe next Summer. Sharing! Wow, interesting about the distances. The park we visited had a special pet section so that’s where we went. It’s nice when parks have that. I know that some National Parks are trying to be more pet friendly, even if it’s just publicizing where dogs have always been able to go more. I’m glad to hear you’ve found a solution to take your dogs with you into National Parks. I know dogs aren’t allowed everywhere so it’s important for people to find alternatives. 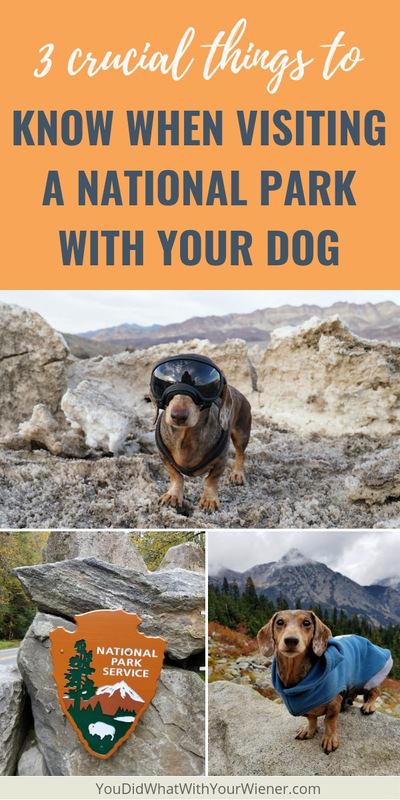 Some people choose not to go to National Parks because of the restrictions but there are also others that don’t go because they believe dogs aren’t allowed inside the park at all. I want to help spread the message that one can bring their dog and still enjoy the experience. I was so disappointed to find out years back that I couldn’t bring dogs into the Sequoias, except for around the parking lot, there wasn’t really much we could do from what I remember. That’s such a handy tip about stride length! Yeah, it really varies from park to part – what there is that you CAN actually do with your dog. Driving through is always allowed and, for some parks, that’s really the highlight anyway. Then there are some that you can’t really see the good stuff without walking at least a short distance on a trail. Obviously, those experiences are more limited for dog owners. Definitely a sad turn of events if you take your dog and don’t find out that you get there that they can’t do most things with you. A couple of years ago my Aunt was excited about her first trip in their new RV. They planned to take their dog and visit some National Parks. I told her that dogs were only allowed along roads and in parking lots at most National Parks. She had no idea! They still decided to take their dog but were able to plan accordingly. Thanks for sharing this helpful information. I never realized there were such restrictions for dogs at national parks. Many pet parents will definitely find this post helpful. I think there are 3 groups of people when it comes to visiting National Parks with dogs. 1) Don’t even know they aren’t allowed. 2) Think they aren’t allowed at all. 3) Those like me that are well aware of the restrictions but challenge themselves to enjoy the park anyway. To be honest I don’t really understand why they don’t allow pups at the park. As long as people clean up after themselves and don’t let their pups eat the wildlife I don’t see an issue. Pups belong in the park! Pups are allowed in the park. They’re just restricted to where they can go and rightly so in my book. Besides being disruptive to wildlife – moreso than people in a lot of cases – they can’t read signs to know how to follow the rules. The liklihood that people wouldn’t pay attention (or care) and let their dog wander off the trail, or not pick up their waste, is very high based on my opinion of the behavior I see out on trails where they are allowed but rules aren’t followed. Thans for this nice article. I wonder if this is for al the national parks? Second I domhave a question about the nice sunclasses, skiglasses the dog is wearing in the picture…. where dan I find glasses speceially fit a dachshund? Yes, these things apply to all National Parks in the US. However, there are a small handful of National Parks that have looser rules than most (maybe a trail or two your dog CAN go on). It’s best to assume these restrictions or research the specific National Park you plan to visit before you go. National Parks in Canada are a different story. Many of them allow dogs, although the rules are getting tighter there too because of too many dogs visiting. 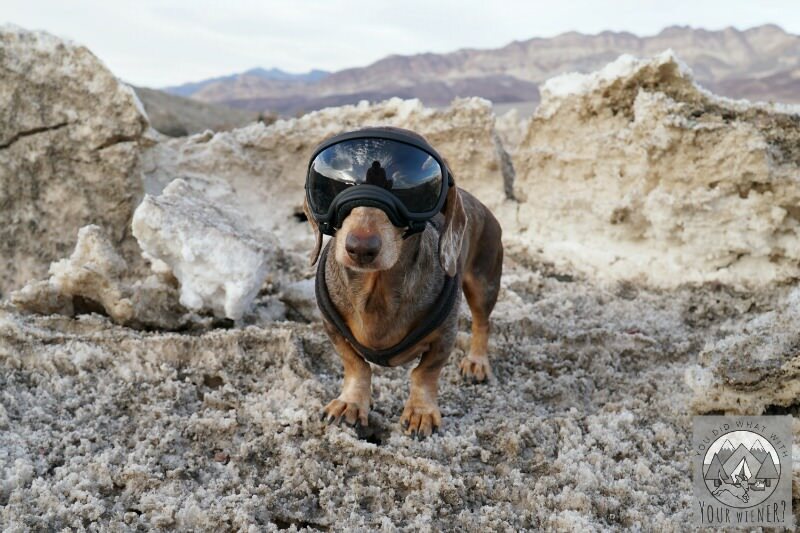 The goggle are from RexSpecs (https://www.rexspecs.com) and are made specifically for dogs. I’m not sure if they ship internationally but you can check (or maybe find something similar there. Ski goggles for little kids may work in a pinch).